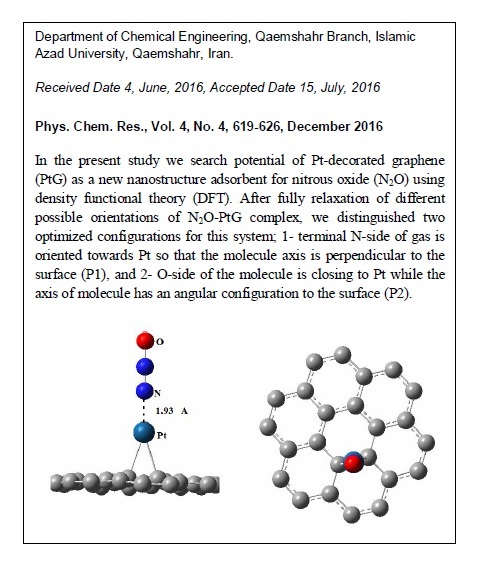 In the present study we search potential of Pt-decorated graphene (PtG) as a new nanostructure adsorbent for nitrous oxide (N2O) using density functional theory (DFT). After fully relaxation of different possible orientations of N2O-PtG complex, we distinguished two optimized configurations for this system; 1- terminal N-side of gas is oriented towards Pt so that the molecule axis is perpendicular to the surface (P1), and 2- O-side of the molecule is closing to Pt while the axis of molecule has an angular configuration to the surface (P2). 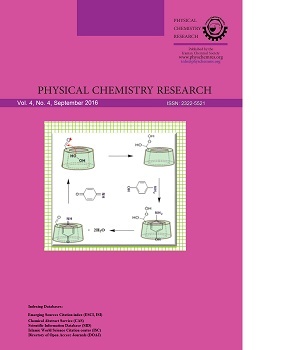 Our results showed high adsorption of N2O on PtG, however there is a significant difference between the value of adsorption for P1 compared to that for P2 (-113.6 (-88.7 BSSE) vs. -41.2 (-32.0 BSSE) kJ mol-1). Results of the charge analyses reveled interesting net charge transfer; the direction of charge is from N2O to PtG for P1 configuration and the reverse is found for P2.